Do the Police responsible for protest chaos? Kisumu today held a peaceful demo, no looting, without Police officers. #NasaDemos - Bana Kenya News, Real African Network Tubanane. 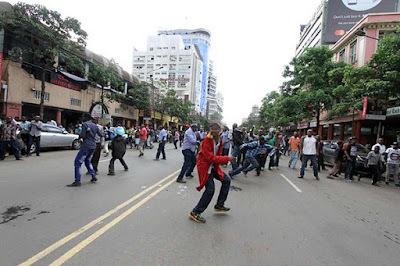 People in Kisumu have continued with the demonstrations towards the death of their loved ones who were believed to be shot by the Anti-riot police officers. In Kisumu, there was no police presence and so, Demonstrations went on peacefully! Patriots gathered from all corners of Kisumu and together they marched to the regional IEBC Headquarters demonstrating and back. This clearly demonstrates that the POLICE are responsible for funding the chaotic protests. The high court has lifted FRED MATIANGI's illegal ban on NASA demos and warned the CS against a colonial mindset. The people in Luo Nyanza held a peaceful demonstration seeking justice to the people who lost their lives in the demonstrations. The appealed to the government that Luo massacre did not start with Jubilee and should be stopped. They also urged the public to practice peace as the demonstrations continue next week.